Now in its fifth year, the Worldwide Plays Festival put on by David Letterman‘s production company and Writopia Lab can always be counted on to showcase fresh new talent. 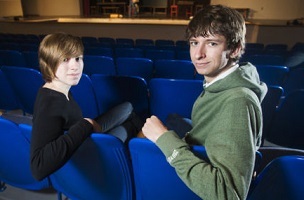 When the 2014 edition rolls around in May, the precocious playwright ranks will include Arizona high school students Peter Chipman and Victoria Stiely. Indeed. The script refers to a diner, apartment, factory and underwater research station, now all gone. The props are, too. The story takes place in real time, and while reading it you can sense the actors’ rising panic as they realize the gravity of the situation. The only prop they can find in the theater is a case of beans. As the clock ticks away, and an audience paying $12 a ticket is about to be seated, they scramble to see how they can make the play work. In addition to watching their play come to off-Broadway life this spring, the duo from Tucson’s St. Gregory College Preparatory School will receive a $1,000 scholarship. Kudos to their arts teacher Lisa Bodden for circulating the Worldwide Pants/Writopia contest flyer.